Consortium partners have come together in the closing months of the project for the SysmedIBD Data Management Meeting in Manchester, UK on 28th and 29th September. Experts from around the Europe in the analysis and treatment of Inflammatory Bowel Disease (IBD) shared the latest developments and results of their recent clinical experiments in a stimulating and open discussion forum. � the sequencing of human and mouse macrophages. 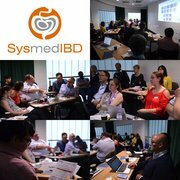 As the SysmedIBD project approaches its conclusion after five years in November 2017, we would like to thank and congratulate everyone involved in the SysmedIBD project for their hard work and commitment to improving the knowledge and treatment options for sufferers of IBD.